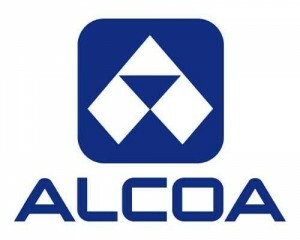 Alcoa Inc (NYSE:AA) easily beat analysts’ estimates to kick off earnings season. This is because most of them don’t understand the relationship between metal producer gross margins and the price of energy. So, they look at Aluminum prices and make projections. Alcoa is looking to increase its margins during this oversupply period in the aluminum industry by catering to the specialty market for high-performance aluminum alloys. Alcoa Inc (NYSE:AA) is still considered by many as an industrial bellwether even though the firm has struggled with growth and profitability following the drop in aluminum prices, and BHP Billiton Limited (ADR) (NYSE:BHP) is more than 10 times bigger with a cap of $102 billion versus Alcoa’s $9 billion. Going over the financials quickly, excluding extraordinary items, Alcoa Inc (NYSE:AA)’s earnings were $0.11 per share, 3 cents above Wall Street’s estimates. Quarterly revenues dropped by 2.9% to $5.83 billion as shipments fell by 5.5% to 1.22 million metric tons, but profits increased by 58.5% to $149 million. The company’s total long term debt has now dropped to $7.7 billion from $8.3 billion in the previous quarter and as a result its debt-to-equity ratio has fallen to 46.2%. Overall, the firm is smaller but healthier. As I discussed in a previous article, the earnings of aluminum (and steel) producers in general and Alcoa in particular are closely tied with fuel prices. The table below shows the relationship using the Pearson Statistics. Since the industry looks to be hedged out six months, oil prices for the quarter ending Sep 2012 were compared to Alcoa Inc (NYSE:AA)’s gross margins for Q1-2013. I have used US Brent Crude ETF as a proxy for Brent and the US Oil Fund ETF for WTI. The negative correlation implies an inverse relationship, ie. as oil prices rise gross margins fall. Since the beginning of Sep 2012 till the end of Mar 2013, both Brent and WTI crude have been volatile, but ultimately flat and so have Alcoa’s gross margins. If there are places where the firm was going to see a significant increase in margins it was in moving a portion of its business to selling products whose ASPs are less dependent on gross energy cost of producing aluminum itself, i.e. high value-added alloys. It also means that Alcoa is a great trading vehicle when there is a mismatch in the percentage move in the price of oil relative to aluminum. 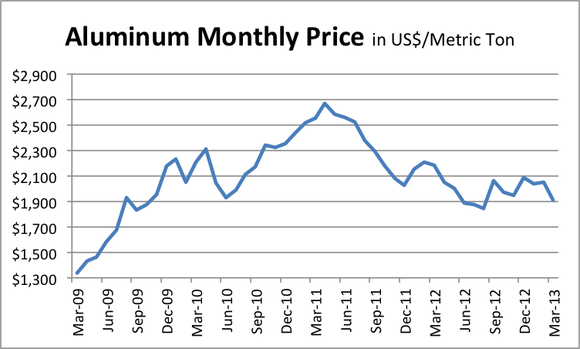 The price of aluminum is still nowhere near what it was a couple of years ago. During the month of March, the spot price for the commodity averaged $1,911 per metric ton, which shows a drop of 12% from March-2012 and a drop of 25% from March-2011. Amid the falling aluminum prices, Alcoa has cut its production, which was evident in the falling shipment levels as it moved towards higher margin products. Alcoa Inc (NYSE:AA) has been focusing higher value, high performance aluminum alloys used by the auto and airplane industry. Both of these industries are driving towards more fuel efficient vehicles that require higher uses of aluminum throughout the car. Auto sales in two of the biggest markets, China and the U.S, have been strong recently. The U.S market recorded sales of 1.45 million cars in March, its highest levels since August 2007. Similarly, Chinese auto sales also climbed by 13.3% in March to 1.6 million units. Alcoa is expecting the demand for aluminum to increase by 7% in the current year.